NHS Annual Meeting -- An Incredible Event! On Tuesday, October 27, 2015, NHS hosted its 36th Annual Meeting. NHS would like to give a huge thank you to everyone who attended the event. 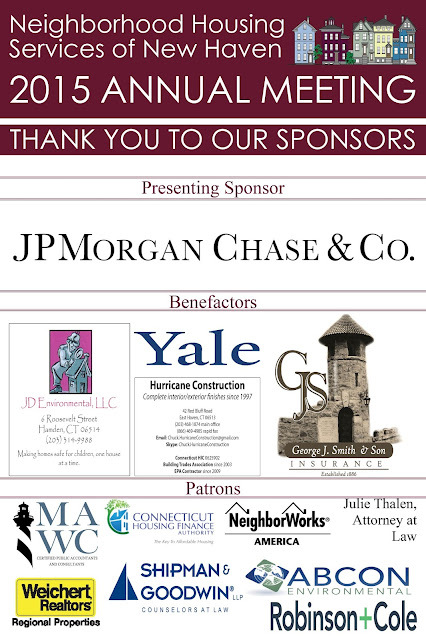 A special thank you also goes to our Presenting Sponsor, JPMorgan Chase, as well as the Benefactors, Patrons, and Friends who have supported this year's event. Their faith in NHS and their financial support made this year's Annual Meeting one of our best. This year's program was full of incredible speakers who have not only used our services, but who continue to support NHS and strive to spread the word about our programs. 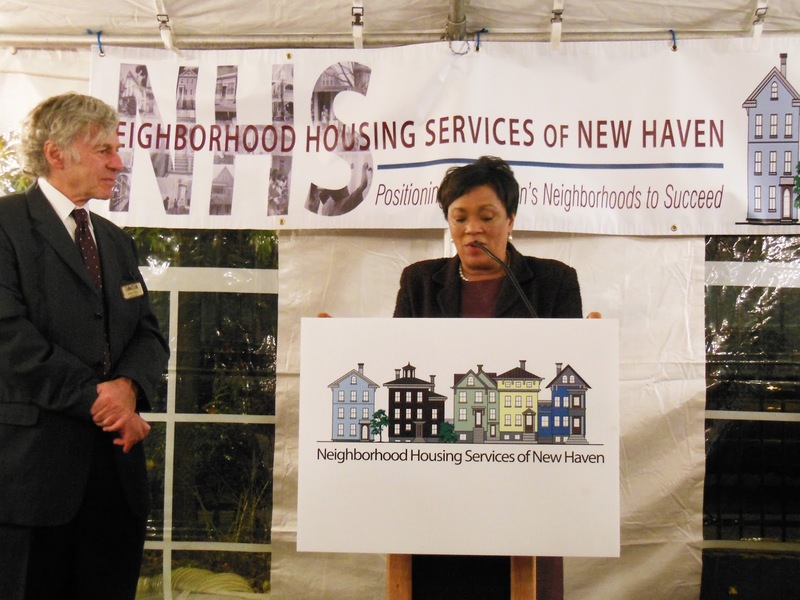 We even had a surprise visit from New Haven Mayor, Toni Harp! A senior at Yale majoring in Architecture with a concentration in Urban Studies. "For three years I have worked at NHS with the FOCUS on New Haven program. 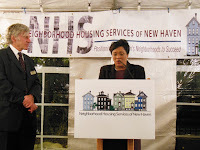 I love being able to contribute to NHS, making New Haven stronger, and creating a model for neighborhood cooperation. 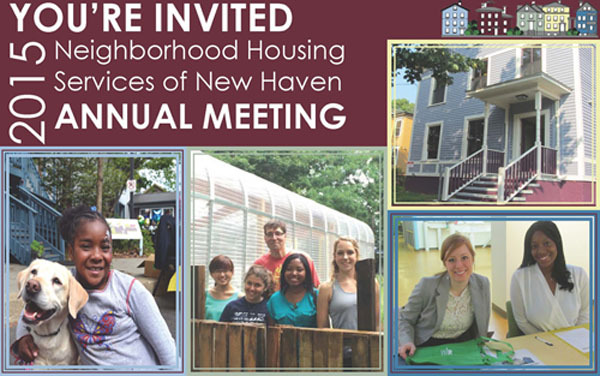 I study architecture because I am interested in how we can use small-scale design to improve quality of life, and NHS is crucial to New Haven as a facilitator of better homeownership, neighborhood engagement, and the power of collective action." "I am a transplanted New Yorker, living in CT for 13 years now. I followed my job to Yale from NYU in New York. I am having fun with my house, which sometimes I almost can’t believe I’m in! It has been very good working with NHS. I started a couple years ago with Clara and now it seems like I know almost everyone at NHS. Everyone has always been very cordial with my various cries for help. Pep is my “go-to” guy!" I truly enjoy working with Neighborhood Housing Services of New Haven. They really made a big change in my life. 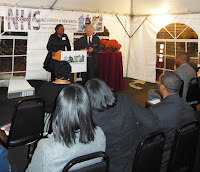 A note from NHS: Hope’s ribbon-cutting was on October 27, 2014 -- exactly one year ago today. We congratulate Hope on her first year as a homeowner and welcome her into the NHS family! 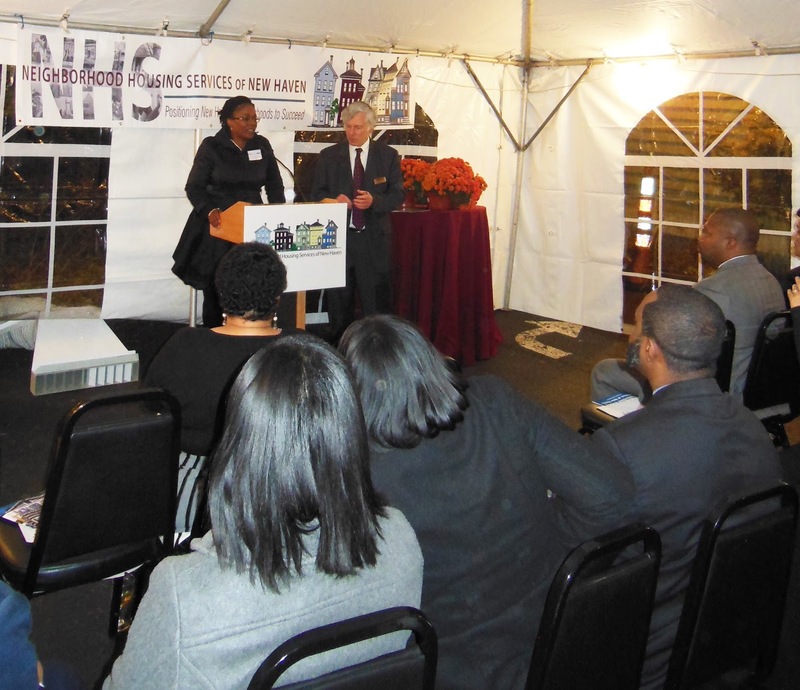 “Homeownership…stabilizes neighborhoods,” Mayor Harp noted in her speech. “But beyond stabilizing neighborhoods, it actually stabilizes families, because this is an investment that transcends from one generation to another." The Big Green Pizza Truck was a huge hit with our guests. The staff was energetic, the music was lively, and the pizza was delicious! There were guests clamoring for more of their unique and creative dishes, such as mashed potato & bacon, buffalo chicken, and the most popular: shrimp florentine. We are also incredibly grateful to Jody Lydic, founder of Lovin' from the Oven Cupcakes. Her desserts were raved about throughout the evening and gone before we knew it! Solar Youth at the Ivy Street Garden! On Thursday, October 15th, NHS staff and SolarYouth reunited in the Ivy Street Community Garden. Last spring, NHS introduced Solar Youth to some of the resident gardeners at Ivy Street, which you can read more about here. Our time together in the Ivy Street garden was so successful, and we were thrilled to have them back in the garden. The afternoon began with snack time and a quick introduction to the garden. Seventeen kids, ages 4 to 13, walked to the garden from their home base at King-Robinson Magnet School. Several high school interns were also present to help the educators supervise the students. Excitement was high, and everyone wanted to get their hands dirty as soon as possible. The exuberant Solar Youth explorers grabbed rakes and leaf bags to help tidy up in the garden before wintertime. A few students got distracted from this task when they discovered peppers, lettuce, squash and kale in the beds along Ivy Street, and decided instead to examine the area with magnifying glasses and to draw what they found; others took their raking assignments very seriously. At day’s end we had three full bags of leaves and a much tidier garden. The Solar Youth crew’s curiosity was boundless. Kids discovered spiders and their webs, identified flowers and plants in the garden, and learned that mint leaves taste good (but that it’s a good idea to ask before you pluck). Solar Youth-ers loved entering the greenhouse and discovering how much warmer it was than the rest of the garden. They even found a grasshopper on the ceiling! After cleanup time, everyone gathered for a group photo. We had a fantastic afternoon in the garden, and we look forward to several more visits from Solar Youth! 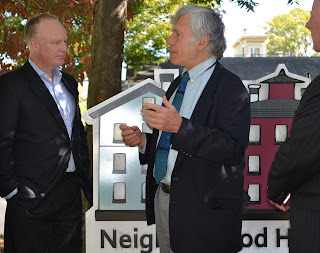 Webster Bank’s funding of Neighborhood Housing Services of New Haven’s affordable housing development, neighborhood revitalization, and homebuyer education and counseling services clearly demonstrates the bank’s strong commitment to homeownership and a comprehensive community development strategy. 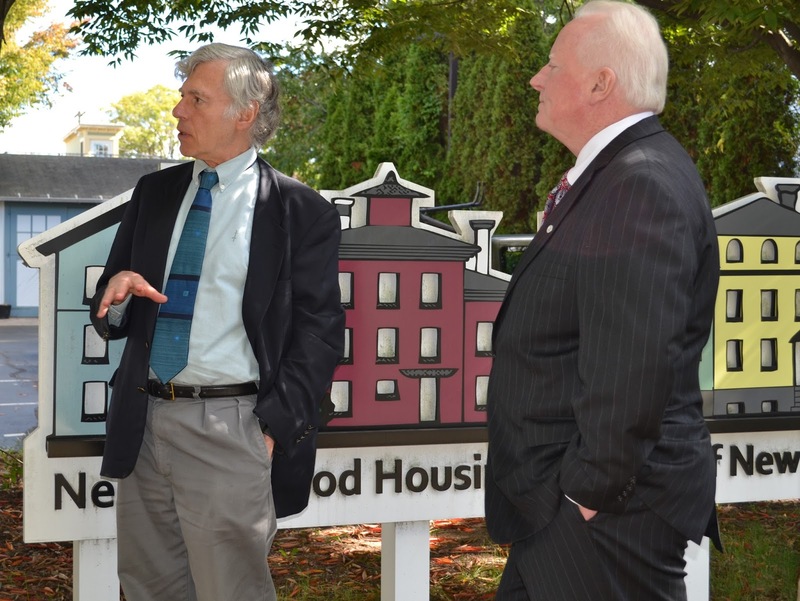 In a time when many of our supporters have decreased or even eliminated their financial contributions, Webster Bank’s increase in financial support this year is a strong reaffirmation of the bank’s support for our work in New Haven’s most challenging neighborhoods. A Huge Thanks from NHS! Press Conference! Join Save the Sound & the West River Watershed Coalition! 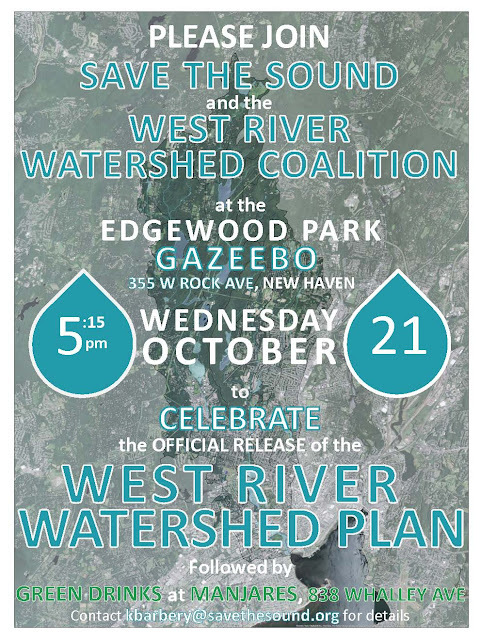 Save the Sound, on behalf of the West River Watershed Coalition, cordially invites you to celebrate the official release of the West River Watershed Plan. To mark the occasion, Save the Sound will be hosting a press conference along the West River in New Haven’s Edgewood Park at 5:15pm on Wednesday, October 21st. Show your support for the West River Watershed and commitment to the goals of the West River Watershed Plan! Arrive for the 5:15pm press conference and stay for Green Drinks at 6pm at Manjares in Westville, where members of the Watershed Coalition will share the major findings and recommendations of the West River Watershed Plan as well as progress we’ve already made to restore and protect the West River and its tributaries. Who: Save the Sound, the West River Watershed Coalition and YOU! Washington, DC -- The third annual America at Home survey from NeighborWorks America, the leading organization dedicated to providing people with safe, healthy and affordable housing, finds that despite a growing economy, the financial pressures of student debt, persistent confusion about the mortgage process and a continuing nationwide marriage rate decline are important factors combining to slow the housing market. 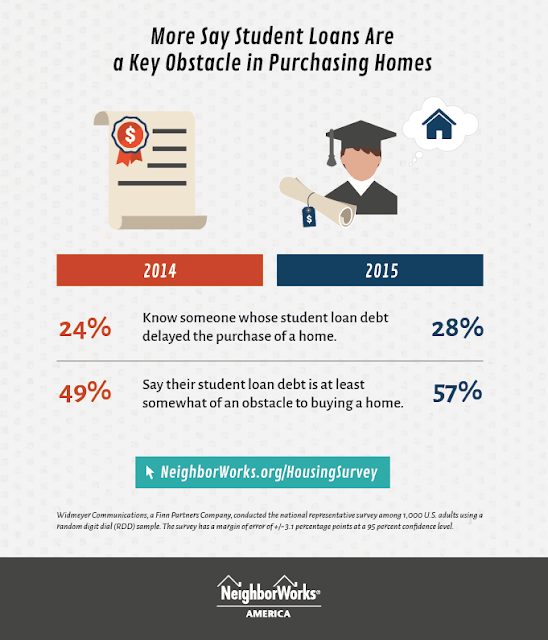 The survey found that student loan debt continues to grow as an obstacle in a consumers’ ability to buy a home, as 57 percent of 2015 respondents who acknowledge having student loans said this debt was either “very much” or “somewhat” of an obstacle, compared to 49 percent of 2014 respondents. Additionally, although mortgage rates remain historically low, a generally steady rise in home prices is outpacing income growth, leading homebuyers – especially first-time buyers – to search for ways to build up a down payment. However, nearly 40 percent of respondents have received “nothing at all” in terms of information about down payment assistance programs for middle-income homebuyers, programs that could provide thousands of dollars to help bridge a savings gap. Finally, the housing market is being pressured by changing demographics. Of the respondents surveyed, 43 percent planned to purchase a home when they “got married or moved in with a life partner.” This is important for the housing market’s rebound, because the median age at first marriage has increased to 29.3 for men and 27.0 for women, according to the Census Bureau, up from 26.8 and 25.1 years, respectively in 2000. Consumers have trouble estimating the accurate costs associated with homeownership and general home maintenance. Respondents estimated an average cost of $15,070 for home maintenance repairs; however, the actual cost for home repairs and upkeep nationwide is more likely between $2,000 and $6,000. While current homeowners estimated cost for repairs to be $12,360, current renters estimated $20,503, suggesting that those consumers in the market for a new home might be deterred by perceived high maintenance costs. Respondents lack adequate information on the consequences of foreclosure. While 32 percent of respondents believe they would have to wait “more than 5 years” after a foreclosure before they were eligible to obtain a new mortgage to purchase another home, the reality is consumers who have experienced a foreclosure need only wait two years before becoming eligible for most mortgage products. Editor’s Note: Widmeyer Communications, a Finn Partners Company, conducted the national representative survey among 1,000 U.S. adults using a random digit dial (RDD) sample. The survey has a margin of error of +/- 3.1 percentage points at a 95 percent confidence level. For a copy of the full findings, please contact Douglas Robinson at drobinson@nw.org. RSVP and Join Us! 2015 NHS Annual Meeting! Learn more about NHS while mingling with residents, contractors, and NHS staff. If you'd like to attend the event, or if you wish to become a sponsor, please email Maria Martinez (mmartinez@nhsofnewhaven.org or 475-227-0530) by Oct. 23rd.